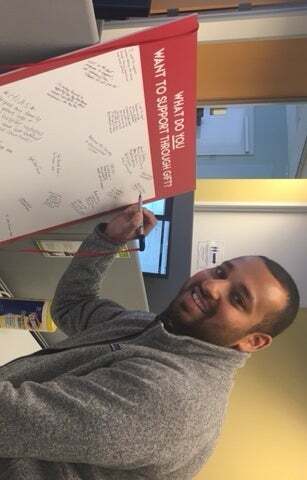 A Clorox employee pledges his #GivingTuesday support. To celebrate #GivingTuesday, Clorox is giving away up to $10,000! That’s right, Clorox has earmarked $10,000 to charitable causes for #GivingTuesday. And with the help of our employees, we’ll give it all away. Every U.S. and Canada employee has a giving account through GIFT, our employee giving program. This year, we’ve decided to put $100 in the giving accounts of 100 lucky employees. They, in turn, can donate the $100 to any qualified nonprofit of their choice, but they must designate a beneficiary of the $100 gift by Dec. 14 or lose the money. We hope this will inspire all employees to consider making a charitable donation today and to tap the power of GIFT throughout the year. And if all 100 employees give away the $100, Clorox will have contributed $10,000 to charitable causes important to our employees to celebrate #GivingTuesday. #GivingTuesday is a global day of giving fueled by the power of social media and collaboration. Celebrated in the U.S. on the Tuesday following Thanksgiving (and the widely recognized shopping events Black Friday and Cyber Monday), #GivingTuesday kicks off the charitable season. This is a time of year when many people focus on their holiday and end-of-year charitable giving — and when many nonprofits receive the bulk of their annual donations. Our #GivingTuesday effort is just one way Clorox encourages employee philanthropy. The GIFT program allows U.S. and Canada employees to schedule year-round and one-off charitable donations through payroll deductions. It also matches employee volunteerism with cash the employee can donate to any qualified nonprofit. Best of all, Clorox will match an employee’s charitable donation dollar-for-dollar up to $2,500 each year. 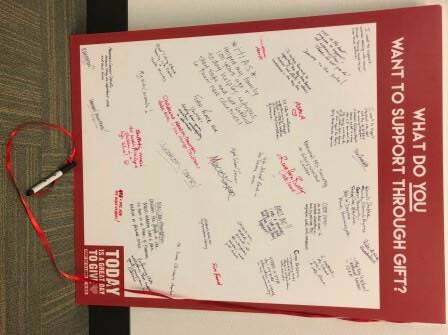 Clorox employees signed a poster pledging support to their favorite causes.